As we all know, Google Docs is a great place to create new documents, presentations, and spreadsheets. It's also a great place to store non-Google editor file types such as video files, images, and PDF's. But, what if you upload and share an image file (for example) and don't want the shared users to be able to download that file? 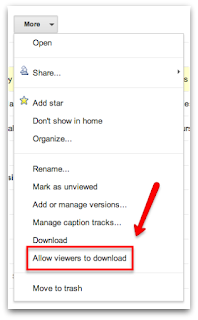 Now, you have the ability to restrict document download in Google Docs! Once the file has been uploaded in to your Google Docs list simply highlight the document file by selecting the 'check box' to the left of the document title and click 'More' above the Docs list. 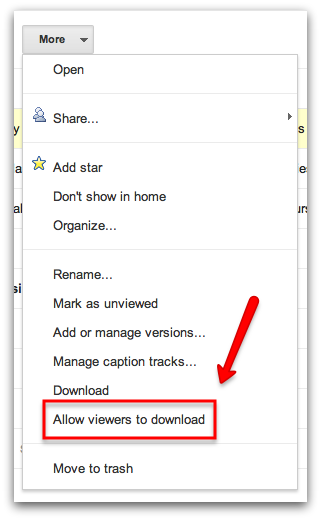 Next, you will see the option 'Prevent Users from Downloading' ... click on that option to ensure the shared users will not have the ability to download the shared file. You can also right click on the file within your Docs list and select 'Prevent Users from Downloading' in the menu options that will appear. What kind of files will you be restricting downloadable access to? Let us know in the comments section below!